Although the .wml extension usually means a WAP1 site, Cingular uses browser sniffing to send either WAP1 or WAP2 content depending on the capabilities of your phone’s browser. If you don’t want to key that long url into your phone, you can find it linked on my WAP portal site yeswap.com under Portals|WAP. So what’s on the MediaNet portal? 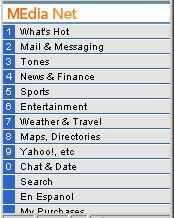 You’ll find a good selection of mainstream sites like Yahoo, CBS, ESPN, Google, Accuweather, Go2 directory and Infospace. Especially Infospace which seems to be hosting and maintaining the site for Cingular and has separate links to their News, Sports and white and yellow page directorys. All the WAP2 Infospace pages have been customized with MediaNet’s rather attractive “theme” of a ruled gray body with orange headers and a “MediaNet Home” link at the bottom of each page. I did find a couple of sites linked from MediaNet which I hadn’t seen before: E! Online and Hotels.com. They both look pretty good and I’ll be reviewing them next. This entry was posted in Carriers, Portals, Site Reviews by Dennis Bournique. Bookmark the permalink.